Shop Doctor Who - Page 121 of 125 - The Place to shop for Doctor Who gadgets. We all know that Doctor Who is awesome and smokers know that Zippo lighters are awesome to. No there is this Zippo 250 lighter that has an engraved Tardis on it so now Doctor Who and Zippo come together and this will be super awesome. If you have a friend that smokes or maybe even yourself this Tardis lighter makes a nice present and it comes in a gift box to make it the perfect Doctor Who present. Smoker or not a Zippo lighter as nice as this one just has to be part of your Doctor Who collection. Come and have a much better look at this Doctor Who Tardis Lighter. This is a classic Zippo 250 lighter that comes in a gift box. 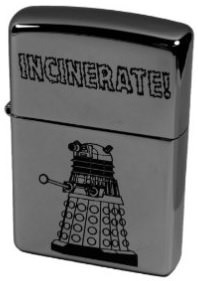 But it also has a Dalek engraved on it and even the words “Incinerate!” as that is why fire does. A great lighter now becomes even better as now it is a Doctor Who Zippo and if you smoke then you know what to get. No more cheap trow away lighters go with a Dalek lighter because you know that it will Exterminate the competition. 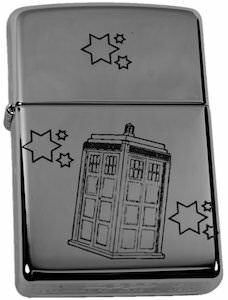 This Specially engraved lighter makes the perfect present for the smoking Doctor Who fan. Come and have a closer look at this Doctor Who Dalek Zippo 250 Lighter. Summer will be getting better when you wear this Tardis tank top. This women’s tank top is black and has a racer back to keep your shoulders nice and open. And on this tank top you can see the Tardis from Doctor Who but this time it is not blue, this time it is painted like the flag of England the Union Jack. And this Doctor Who tank top comes in a nice range of women’s sizes and it is made from 100% cotton so that you can wear this Tardis shirt all summer long. 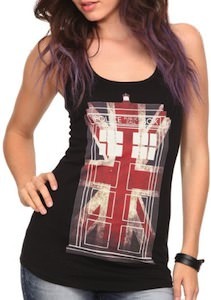 So if you are looking for a typical British Tardis shirt then come see this Doctor Who Union Jack Tardis Tank Top. 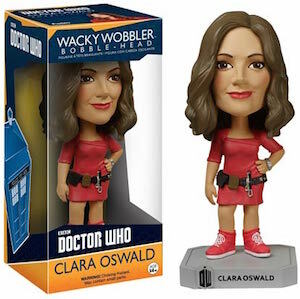 Of course it’s Doctor Who number 12. This button will tell you that. This 1 1/4 inch button with on it the portrait of the 12 Doctor and in the background you can see details of the intro video of the Doctor Who episodes and then on the foreground it says “I am the Doctor”. A fun button like this is great for a bag, jacket, backpack or anything else fabric so that you can show the world who the Doctor is. 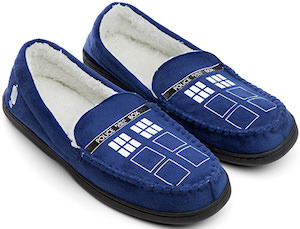 Peter Capaldi is the Doctor and now you can show who the right Doctor Who is. Don’t wait come get your own I Am The Doctor Button.